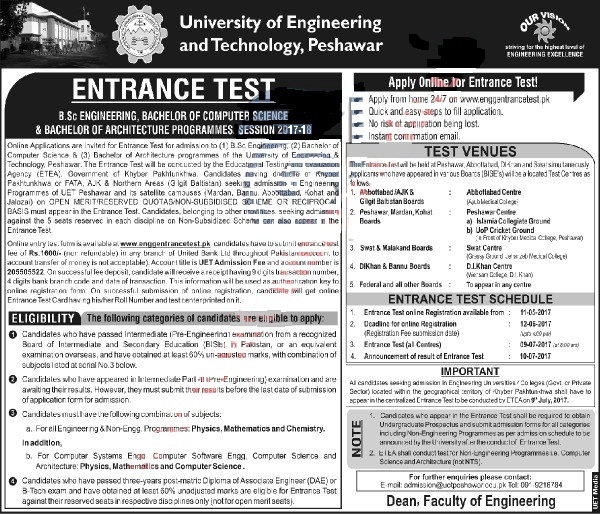 UET Peshawar ETEA Entrance Test Preparations Online Platform is being given by us for your facility to get prepare yourself in time as schedule of ETEA has been announced with an immediate effect.The University of Engineering and Technology, Peshawar is one of the leading institute of higher learning in the country that every year offers admission in undergraduate, postgraduate and Ph.D programs in various fields like philosophy, law, social sciences and engineering. Established in 1980, UET Peshawar has become one of the premier higher learning institutes in Pakistan after achieving several milestones in this short span of time. Along with mait is now ranked among the top 10 Engineering universities of Pakistan by Higher Educational Commission (HEC). 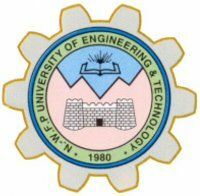 Each year, the university invites application from suitable candidates who are interested in seeking admission in any of the programs being offered by UET, Peshawar. As it is one of the most prestigious university in the country so there is no surprise in the fact that thousands of applications are received against each offered admission especially for the engineering programs. Due to the availability of limited seats, UET Peshawar conducts a written test which is held under the supervision of Educational Testing and Evaluation Agency (ETEA), Government of Khyber Pakhtunkhwa. Every individual who wants to secure admission at UET Peshawar, it is extremely important for him to pass the written test with high marks as it has the written entrance exam has the 50% weight-age in the calculation of final merit. If you can secure high grades in the ETEA entry test, it increases your chances of being granted the admission despite of having a little poor previous academic record. In order to help all of our visitors in passing their UET Peshawar ETEA entrance test for Pre-Medical/Pre-Engineering with high grades, we have provided several free online tests on our website through which you can prepare for the actual exam in best possible way. Just click on the link given above on this page and it will take you to a new page where several online tests related to different subjects are provided. By attempting these tests, you can evaluate you current level of preparation and also highlight the areas that need further improvement.